"Well, I was born yesterday." One of the biggest highlights of the record-breaking film Marvel's Avengers: Age of Ultron, is the introduction of the new characters! 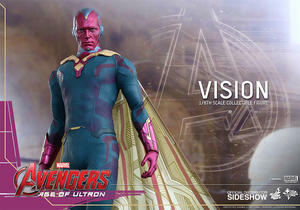 Originally planned to be the perfect "evolution" for Ultron, the Avengers were able to retreive the android, Vision, and make him a valuable ally for Earth's Mightiest Heroes to stop Ultron from eradicating mankind! 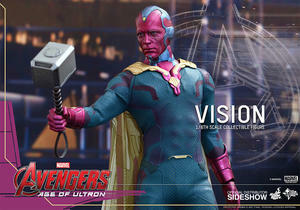 Sideshow Collectibles and Hot Toys are excited to present the humanoid hero that many fans have been waiting for - the Vision Sixth Scale Collectible Figure! 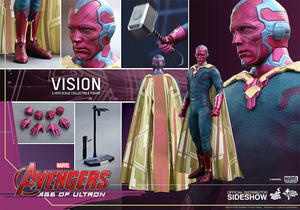 The movie-accurate Vision Collectible Figure is specially crafted based on his image in Avengers: Age of Ultron. 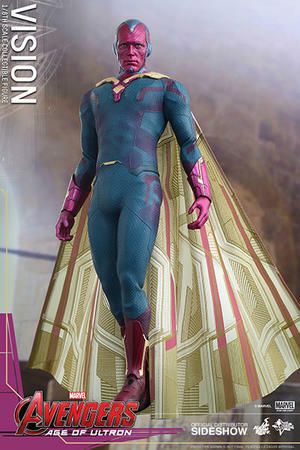 It features a newly developed head sculpt with detailed texture and Mind Stone, specially tailored costume and cape, Thor's hammer, Mjölnir, and a specially designed figure stand. Your Avengers: Age of Ultron collection wouldn't be complete without the addition of this powerful android!